Alexej (Alexi) Jawlensky, the son of a colonel, was born in 1864 in Torrzhok, Russia. When he was ten, his family moved to Moscow. Following family tradition, he attended cadet and military school and became a lieutenant in the Samogita Infantry–Grenadier’s Regiment, based in Moscow. During this period, he frequented the Tretyakov Gallery in Moscow and began to paint. In 1889, Jawlensky transferred to a regiment in St Petersburg so he could attend classes at the Royal Academy of Art and study with Il’ya Repin, a prominent realist artist. It was here that he met Marianne von Werefkin, a private pupil of Repin’s. 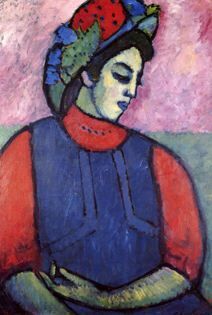 In 1896, Jawlensky, now a captain, left the army and moved to Munich with Werefkin to study with the artist Anton Azbe. At Azbe’s studio, Jawlensky met Wassily Kandinsky, a fellow expatriate Russian artist. Jawlensky and Werefkin spent summers traveling throughout Europe studying the work of avant-garde artists such as Vincent van Gogh and Paul Gauguin and painting. In 1905, Jawlensky exhibited in Paris with the Fauves at the Salon d’Automne. In 1907, he painted with Matisse in his studio and began a long friendship with the Nabis artists Jan Verkade and Paul Sérusier. Through these artists, he became familiar with Theosophy, mysticism and synthesist principles of color. His style during this period was characterized by simplified forms, flat areas of color, and heavy black outlines. Between 1908 and 1910, Jawlensky and Werefkin spent summers in the Bavarian Alps with Kandinsky and his companion Gabriele Münter. Painting landscapes of their mountainous surroundings, they experimented with one another’s techniques, and formulated an expressive use of color divorced from representational form. In 1909, the artists found the Neue Künstlervereinigung München (NKVM), an avant-garde art association. In 1911, Kandisnky and Franz Marc left the NKVM to form the Blaue Reiter. Jawlensky and Werefkin remained in the NKVM until 1912, when they too joined the Blaue Reiter. The Blaue Reiter did not survive World War I. However, in 1924, a new group, the Blue Four, was formed by Kandinsky, Jawlensky, Paul Klee and Lyonel Feininger. Expelled from Germany after the outbreak of World War I, Jawlensky moved to Switzerland where he began a cycle of increasingly abstract landscapes depicting the view from his window in St Prex on Lake Geneva. Between 1917 and 1920, he produced his best-known series of works: the Mystical Heads (1917–19), and the Saviour’s Faces (1918–20). In these works he reduced conventional portraiture to abstract line, form and color., In 1921 he began another cycle in the same vein, his Abstract (sometimes called Constructivist) Heads (1921–35). This series, characterized by the use of recurring compositional elements, presented increasingly stylized heads. In 1922, Jawlensky married Werefkin’s former maid Hélène Nesnakomoff, and moved to Wiesbaden. Beginning in 1929, Jawlensky suffered from a crippling arthritis that severely limited his creative activity and eventually resulted in complete paralysis. Nevertheless, he continued to paint, producing more than 1000 works in the Meditations series (1934–37), which included abstract landscapes and still-lifes, as well as portraits. This series represented further variations on the face broken down into its component parts of simple geometric shapes, line and color. In 1933, the Nazis forbade Jawlensky to display his art and removed 72 works from German museums In 1937, two of his paintings were included in the “Degenerate Art” exhibition. By this time his images of faces had been deconstructed to their most basic form: a cross forming the expressive brow, a nose and mouth on a richly colored background. In 1938, Jawlensky’s physical condition forced him to stop painting altogether, and he died in March 1941 in Weisbaden. He was buried in Russia.